A man was shot dead in East Los Angeles, a sheriff’s deputy said today. The shooting in the 700 block of North Brannick Avenue occurred at 11:30 p.m. Saturday, said Deputy Charles Moore of the Sheriff’s Information Bureau. Deputies dispatched to the scene in response to a “gunshot victim” call reported that the victim was standing at an unknown location when a person fired several shots in his direction, said Deputy Wally Bracks of the Sheriff’s Information Bureau. The victim was pronounced dead at the scene and there was no suspect information, Bracks said. Sheriff’s homicide detectives asked anyone with information regarding the shooting to call them at (323) 890-5500. EAST LOS ANGELES – Authorities Tuesday identified a man who was fatally shot in East Los Angeles by a killer who remains at large. The shooting was reported at 8:36 p.m. Monday in the 6600 block of Hereford Drive, said Deputy Kimberly Alexander of the Sheriff’s Information Bureau. Francisco Amaro Jr., 30, of East Los Angeles died at the scene, the coroner’s office reported. Homicide detectives learned that Amaro had left his residence on foot after a brief argument with family members, Alexander said. A short time later, a gunshot was heard west of Amaro’s residence, and he was found lying on a sidewalk, the sheriff’s department reported. Anyone with information on the crime was urged to call the Sheriff’s Homicide Bureau at (323) 890-5500. Authorities Monday identified a 16-year-old boy killed in an apparent-gang-related shooting in East Los Angeles. 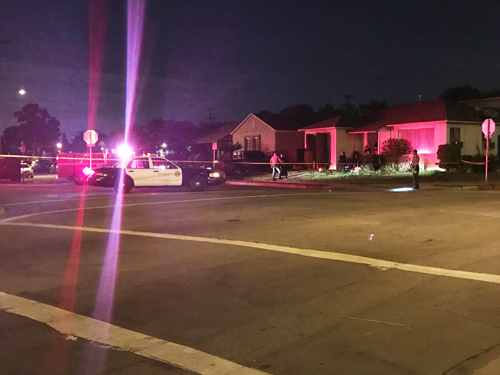 The shooting occurred at 2:40 a.m. Sunday in the 3800 block of Whittier Boulevard, Deputy Lisa Jansen of the Sheriff’s Information Bureau said. Joanthony Rodriguez of Los Angeles died at the scene, coroner’s Assistant Chief Ed Winter said. The shooting is believed to be gang-related, Jansen said. Three men were shot while in front of a convenience store in East Los Angeles and one of them died at an area hospital, the Sheriff’s Department said Sunday. The victim was later identified as Juan Carillo Ortiz, 18, according to Deputy Lisa Jansen of the Sheriff’s Information Bureau. The Bureau did not release a place of residence for Ortiz. The shooting was reported at 5:56 p.m. Saturday in the 4100 block of Cesar E. Chavez Avenue, said Deputy Ryan Rouzan of the Sheriff’s Information Bureau. Ortiz, a 19-year-old man was standing outside a convenience store with a 66-year-old man when witnesses reported hearing several gunshots fired, Jansen said. The victims were rushed to an area hospital, where Ortiz, who was shot several times in the torso, was pronounced dead. The other two victims were listed in fair condition, she said. Sheriff’s homicide detectives asked anyone with any information regarding the shooting attack to call them at (323) 890-5500. Man Shot on Halloween Night in East L. A. Authorities searched Monday for whoever shot a man to death in East Los Angeles. The shooting was reported about 7:30 p.m. Monday in the 500 block of South Williamson Avenue, said Deputy Kimberly Alexander of the Sheriff’s Information Bureau. The victim, estimated to have been around 25 years old, was walking with two other people on Gerhart Avenue when a gray sedan slowed down and someone inside fired on them, Alexander said. The victim staggered to Williamson Avenue, where he collapsed. He was transported to a hospital, where he was pronounced dead from a single gunshot wound to the upper body, Alexander said. It was not immediately known if the two people who were with the victim were struck by gunfire, she said. The whereabouts of the shooter and the victim’s companions are not known, Alexander said. The coroner’s office identified Sunday a man found shot to death on an East Los Angeles sidewalk. Jose Espinoza, 46, of San Fernando, was discovered by deputies dispatched about 12:30am, Saturday to the 400 block of Union Pacific Avenue on a “shots fired” call, Deputy Guillermina Saldana of the Sheriff’s Homicide Bureau said. When they arrived they found Espinoza lying on the sidewalk suffering from a gunshot wound to the upper torso, Saldana said. Espinoza was pronounced dead at the scene. Man Shot in East L.A.
A man was shot to death during a discussion with two men in East Los Angeles, authorities said Tuesday. The shooting was reported about 10 p.m. Monday at 664 South Ford Blvd., said Deputy Lisa Jansen of the Sheriff’s Information Bureau. Deputies who responded to the shooting call found the victim suffering from a gunshot wound to the upper torso, she said. Homicide detectives learned “two male suspects came to the residence and knocked on the front door,’’ Jansen said. “The victim came to the door and began talking to both suspects through the closed metal security screen door. The suspects fled on foot, headed north, she said, and the victim was pronounced dead at the scene. Anyone with information about the shooting was asked to call sheriff’s homicide detectives at (323) 890-5500 or anonymously through Crime Stoppers at (800) 222-TIPS (8477) or http://lacrimestoppers.org. The Board of Supervisors Tuesday approved $10,000 rewards in hopes of solving a fatal shootings on New Year’s Day in East Los Angeles. Supervisor Hilda Solis proposed the reward in the Jan. 1 slaying of 25-year-old Tommy Gamez, who was shot to death in his car, which had crashed into three parked vehicles in the 600 block of Gerhart Avenue in East Los Angeles. Investigators believe the shooting – which happened about a half-hour after the new year began – was gang-related. Anyone with information was asked to call sheriff’s homicide Detective Dawn Retzlaff at (323) 890-5500. Augmented by a $10,000 reward offer, the search will continue for the gunman who shot two brothers of a Compton city councilman in East L.A., killing one of them in what authorities call a targeted gang attack but that the councilman describes as a case of mistaken identity. The Los Angeles County Board of Supervisors approved a $10,000 reward on Tuesday for information leading to the arrest and conviction of the gunman who shot Councilmember Isaac Galvan’s brothers. Supervisor Hilda Solis authored the motion. Compton Mayor Aja Brown Tuesday issued a statement in support of Galvan. “The Compton City Council joins with our residents in mourning the loss of Councilmember Isaac Galvan’s brother and in extending our thoughts, prayers and love to his mother, his brother’s children and entire family. The shooting took place in the 900 block of South La Verne Avenue just after noon Monday, said sheriff’s Deputy Mike Barraza. Compton City Councilman Isaac Galvan announced on his Facebook page Monday afternoon that his brothers Dennis and Larry (Lorenzo) Galvan had been shot in front of his mother’s house, and Larry had been killed. Galvan told reporters outside his mother’s home Tuesday that the shooting of his brothers was a case of mistaken identity. The two Galvan brothers were walking south on La Verne Avenue when a man walked up, pulled out a gun and shot them, Barraza said. They were taken to a hospital, where Larry Galvan died. The gunman fled the scene in an SUV headed north on La Verne Avenue. The shooting of Galvan’s brothers appeared “gang-related and targeted,” according to the sheriff’s department. Anyone with information on the shooting was asked to call the Sheriff’s Homicide Bureau at (323) 890-5500. Tipsters can also call Crime Stoppers at (800) 222-TIPS. All tips can be submitted anonymously. The coroner’s office Monday released the name of a man found shot to death inside a vehicle in unincorporated East Los Angeles. He was Tommy Gamez, 25, of East Los Angeles, said coroner’s Lt. Larry Dietz. The discovery was made at 1 a.m. Friday at Sixth Street and Gerhart Avenue, said Sgt. I. Renteria of the East Los Angeles Sheriff’s Station. The vehicle with the victim inside had crashed into three parked cars, a news videographer reported from the scene. California Highway Patrol officers investigating the crash found the dead man inside the vehicle, the videographer said. Investigators will determine whether the man crashed the vehicle after he was shot, Renteria said.